If you are considering works on your property we offer, in conjunction with a local building surveyor, the opportunity to discuss your proposed project, whereby he will be able to draw up plans and specifications as necessary for planning applications and building regulations applications if required, in an impartial and friendly manner. For extensions and alterations, once planning permission has been granted you can use our estimating service. We feel that it is important to put a lot of effort into estimating your project. Upon request we will visit you to assess the site and discuss your requirements and needs. With this information and plans (where necessary) we price your project as accurately as possible. Because of all the detail we include in our pricing it may take up to 14 days to provide you with a price. If you only require an estimate based on square meterage please let us know and we would be happy to oblige. 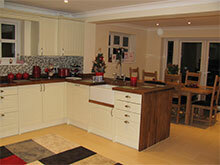 Extensions and alterations make up a large percentage of our business, mostly from recommendations. We have carried out extensions and alterations in Sudbury and the surrounding villages and have recently travelled as far as Wivenhoe and Cambridgeshire. Brickwork and carpentry are two trades close to Shane's heart as this is where he started his training and then working with others, gained the knowledge and techniques used by S. T. Green Builders today. 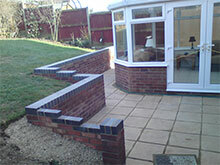 Brickwork and carpentry are not just the foundation of S. T. Green Builders but of every project that we do. As with Brickwork and carpentry, plastering is vital for a good finish on any project and although we mainly carry out standard plastering if required as part of a job we can organise with others for specialist plastering too. At S. T. Green Builders we believe in a high-end finish for all of our projects, however with kitchens being the heart of the many homes it seems even more important, that is where our kitchen design and installation service can really help. Sometimes it is those little things that you may not have thought of that make a huge difference. We have various manufacturers that we deal with and are happy to supply your kitchen for us to install or to install a kitchen that you have sourced directly without designing it with you. Over the years we have built good working relationships with other trades who share our ethics. This allows us to organise your whole project including electricians, plumbers, glaziers (including lead lights) and security such as gates, automation, garage doors, intercoms etc. For you this means that you can relax and let us take the stresses of project management off your hands and for us it means that we can be in control of deadlines and having the appropriate skills on site when we need them most. Of course if there is someone that you already know and are keen to have on site we would be happy to work with them too. Your satisfaction is of the utmost importance to us and we would never leave a job unfinished or a customer unhappy. We carry out all works with an appropriate contract and offer up to 12 months guarantee on all of our work.